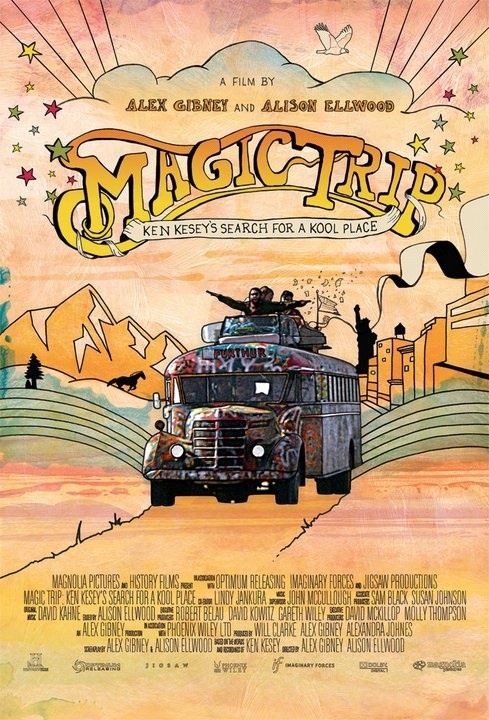 Magic Trip is a new documentary by Alex Gibney and Alison Ellwood about Ken Kesey and the Merry Pranksters that features footage from their legendary “Magic Bus” road trip across the US in the summer of 1964. The documentary was recently reviewed in the New York Times and you can now watch the film on demand. In 1964, Ken Kesey, the famed author of “One Flew Over the Cuckoo’s Nest,” set off on a legendary, LSD-fuelled cross-country road trip to the New York World’s Fair. He was joined by “The Merry Band of Pranksters,” a renegade group of counterculture truth-seekers, including Neal Cassady, the American icon immortalized in Kerouac’s “On the Road,” and the driver and painter of the psychedelic Magic Bus. Kesey and the Pranksters intended to make a documentary about their trip, shooting footage on 16MM, but the film was never finished and the footage has remained virtually unseen. With MAGIC TRIP, Gibney and Ellwood were given unprecedented access to this raw footage by the Kesey family. They worked with the Film Foundation, HISTORY and the UCLA Film Archives to restore over 100 hours of film and audiotape, and have shaped an invaluable document of this extraordinary piece of American history.